Teresa Farino, iberianatureforumer and probably the most knowledgeable English guide to Spain’s flora recently published her latest book: Wild Spain: The Animals, Plants and Landscapes. This is something I would have liked to have written but she beat me to it, so fair play to her. An essential read which you can buy from our Amazon bookshop at no extra cost here. Spain is one of the richest countries in Europe in terms of flora and fauna – its mammals include wolves, bears and the endemic Iberian Lynx, it has the highest number of breeding bird species in Europe, some of the best butterfly sites and an outstanding array of wildflowers. The range of habitats is vast, from the snow-capped mountain peaks of the Pyrenees through evergreen forests, olive groves and wood-pasture to freshwater wetlands and the arid sub-desert of the south. Few other European countries can rival its appeal to those interested in wildlife and the environment. “Wild Spain” celebrates the landscapes and natural history of this surprisingly diverse country, including the Canaries and Balearics. Expert naturalist and landscape historian Teresa Farino examines the geography and climate, the many different habitat types and the remarkable variety of wildlife, including the many endemic species and impressive list of rarities for which Spain is a last refuge. More than 230 superb colour photographs bring alive their dramatic world. The past 20 years have seen a revolution in Spain in terms of wildlife conservation and environmental awareness, and the final section of the book looks at the country’s protected areas, the development of green tourism and where to watch wildlife. 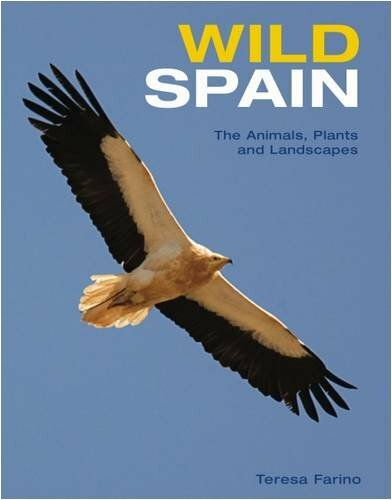 This is a wonderful book, containing many superb photographs of Spain’s tremendously varied wildlife by a well-known photographer of many years experience who lives in Spain. However, it is not just a picture book (like so many photographic books are), but a detailed and authoritative guide to the habitats and fabulous and often unexpected fauna and flora of Spain. It is currently the best book available on Spain’s wildlife and habitats in terms of the type of information it provides, and an absolute visual delight. Thoroughly recommended. When Teresa isn’t writing books, she does these very popular tours with her outfit Iberianwildlife. Some of you will have read on iberianature Dylan Walker’s excellent summary of whale watching in the Bay of Biscay. Now I’ve managed to get hold of a copy of his book (co-written with Graeme Cresswell) on whale and dolphin watching in the European Atlantic (Whales & Dolphins of the European Atlantic. This is an attractive and excellent practical guide which manages to condense in 88 pages a great deal of useful information through very clear and efficient use of text, tables, photos and images – one of the best uses of space I’ve seen in any guidebook. The book features an introduction to cetaceans and the region covered (much of which can be accessed from the coasts of Northern Spain) and great practical tips and know-how on how to watch whales and tell them apart, something many of us know very little about. The introduction also includes sections on watching whales from ferries and boats, typical whale behaviour and the influence of sea conditions. They clearly have years of experience behind them and have decided to share this with the rest of us. The book then moves onto the illustrated profiles of the 18 regularly occurring and 13 rare cetaceans found in the region. Each profile includes a description of behaviour, status and distribution and is illustrated by an image of the species and computer enhanced photographs annotated with useful tips on identifying the species. There is also a colour distribution map accompanied by a monthly frequency bar chart, and an original image depicting the species side on in the water helpfully including a gannet for scale. The book also includes articles on identifying Mesoploden beaked whales (the toughest challenge of them all) and rare species, and finishes with a glossary. I also liked the handy size and the plastic cover reminding us that this is a practical guide and tempting us to get out on a boat and use it on a blustery day somewhere in the Atlantic. On a final note, the book is published by WILDguides. This is a non-profit publisher which gives all of its profits to conservation organisations that work on the area or organisms treated by each guide. I wonder if they’ll get round to translating it into Spanish. 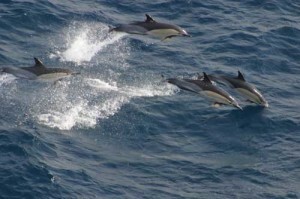 Top photo is of a school of common dolphins sent to me by Dylan. 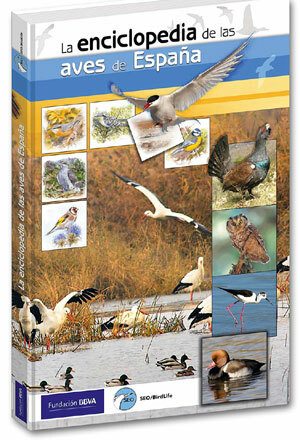 SEO has teamed up with a well-known bank and produced this multimedia encyclopedia of the 563 birds seen commonly in Spain. The site is packed with useful information on everything you could think of connected with birds in Spain with heaps of pictures, sound, video, games for kids and maps, and easy to navigate around. It is, however, frustratingly to easy to close the main window. People with slow internet connections should probably refrain, but interestingly, 60,000 free CD-ROM/books containing the complete encyclopedia are also to be distributed. Wetlands: Delta del Ebro, Aiguamolls del Empordá and Estany d’Ivars. Pyrenees and Pre-Pyenees: Aigüestortes, Cadí-Moixeró, Montrebei y la Terreta, Vall de Núria. Mediterranean landscapes: Parque Natural dels Ports, Cap de Creus and Montserrat. Urban surroundings: Delta del Llobregat (Barcelona). Download the pdf here in Catalan or here in Spanish. There does not as yet appear to be an English version. See also the press report from SEO on this. Thanks to Rick for letting me know about this. After a great deal of work by Clive, we are pleased to announce the start-up of the Iberianature Forum bookshop. It’s one of those Amazon associated schemes. We get 5% from Amazon on any book which you click on and then buy. This will go towards the server costs, which in the case of the forum are rather high. So if you fancy buying someone a book about Spain for Christmas, and you like this site, why not do it through us at no extra cost to you. Spanish language books will also be included soon. 27/02/2006 I recently bought Anfibios y Reptiles de la Peninsula Iberica e Islas Baleares (Guias Verdes) by Toni Aragon Rebollo, 2006. 39 euros or thereabouts. This is a very well organised and clearly written guide. Before the field guide itself, there is an ample introduction on the status of herps in Spain and a fascinating section on their place in Spanish folklore, from which I’ve quickly translated this on lizards. In the north of the Peninsula, it was believed that lizards were friends of men, while snakes were related to women. They told that lizards would leap at women during their period (Translator’s note: My mother-in-law has told me about this). Similarly in Seville , geckos were said to chase after women. There also stories of lizards climbing into women’s vaginas while they slept. In the southeast there is the belief that if you come across a lizard with two tails and you put it in a plate scattered with flour, it will draw the winning numbers in the lottery (two-tailed lizards occasionally occur when a new one is regrown without the old having been totally severed). Another belief related to lizards tails is that they are a cure warts. This belief should be combated as the loss of its tail can cause great harm. Murcia they are known as pelás. This comes from the “powers” they are said to have. It is thought that if you misfortunate enough for a gecko to fall on your head you will go bald as a coot. In some villages just the mere spit from a gecko is enough to leave you hairless”. All no doubt true, although biologists claim that geckos can’t spit. Thoroughly recommended. Good drawings and photos too. Once the sun had risen, two wolves came into Seville and ran across the city. One of them, frightened by the shouts from the people, entered the Church of Santa Catalina, ran up to the high altar and stained the priest’s chasuble with its saliva , before fleeing from the people in pursuit and those attending mass. It doubled back before being slain by arrows in the outskirts by the Church of San Pedro . Its head was cut off and taken to the Duke. The other wolf fled towards the Templo de St Lucia and left the city unharmed. An excellent read and I’ll be translating more short extracts over the coming months.. You can order a copy here from Oryx. Snip at 30 euros. (I’m not on any commission by the way).